The Bangalore Royal Challengers have almost as many South Africans in their squad as the sides representing that country (even without the injured Kevin Pietersen). Jacques Kallis, Mark Boucher and Dale Steyn all feature, whilst Rahul Dravid demonstrated in this year’s IPL that there’s a role for him in Twenty20 cricket which doesn’t simply involve driving down the run-rate. Somerset‘s preparation has been dominated by Marcus Trescothick’s return to India, with some of the coverage seemingly willing him to suffer a breakdown. Assuming all is well with Trescothick, he and Justin Langer make an experience opening pair, with possible future ‘England’ wicketkeeper Craig Kieswetter also capable of making quick runs. It’s difficult to assess how well the English sides will do, but at first glance it seems a mighty task for Somerset to win the tournament. Sussex have a reasonably balanced side which was impressive during the English domestic Twenty20 Cup, with the batting of Michael Yardy and Ed Joyce and the bowling of James Kirtley particular highlights, with Luke Wright and to some extent Yasir Arafat capable both of adding runs and taking wickets at crucial moments. The side may struggle against some of the millionaire IPL teams, but perhaps greater experience of Twenty20 cricket will count in their favour. Trinidad & Tobago are arguably considerably stronger than the side which is representing the West Indies at the moment, with Dwayne Bravo one of the stars of the (now presumably defunct) Stanford 20/20 competition alongside spinner Dave Mohammed, and with Windies wicketkeeper Dinesh Ramdin also in the side. Wayamba have the experience of Mahela Jayawardene and the magic of Mendis. The latter will most likely bamboozle a number of players who are missing international experience, although he didn’t quite live up to his billing for Kolkatta in the IPL. The side look more like dark horses than front-runners, but, as I’ve already said, anything could happen over 20 overs. Victoria might suffer for the loss of Dirk Nannes, but David Hussey and Brad Hodge have the class to make an impact with the bat. Bryce McGain has another chance to make an impact outside of Australia following his disappointing Test ‘career’. 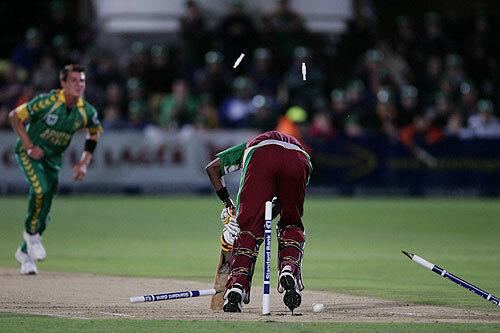 Mark Gillespie’s 4-7 against Kenya in 2007, taken in less than three overs. Gillespie’s bowling, a record at the time, condemned Kenya to their worst-ever total of 73 all out (although they managed to post an even more humiliating 67 all out against Ireland in Belfast the following year). Gul himself has the third-best figures, taking 4-8 in Pakistan’s Dubai demolition of Australia back in May (youtube here). The fourth-best analysis is Dale Steyn’s 4-9 against the West Indies, which included an absolute ripper to see off Devon Smith. Sadly for Steyn, the Windies were chasing down a meagre 58 in a rain-shortened match, so his remarkable haul wasn’t enough to secure victory for his side. The fifth-best figures come from earlier on this week – Shahid Afridi’s 4-11 against the Netherlands in the decisive match that saw the Dutch eliminated from the World Twenty20 (youtube here). New Zealand beat India in their recent warm-up match for this tournament, which is bound to raise hopes that the Black Caps will pose a real challenge. Brendon McCullum is perhaps the archetypal Twenty20 batsman (as he showed in his dramatic introduction to the IPL last year), and Daniel Vettori and Jacob Oram are both top-class bowlers in the short format, so anything is possible, but it would still be quite a shock if New Zealand were to take home the trophy. Scotland’s preparations for the competition have been hit by John Blain’s walk-out, and the Saltires’ fortunes in general have been on a downward curve for the last four years. Gavin Hamilton (who has played Test cricket) is still around, but there seems little hope for Scotland to win a match in the tournament, especially given the group they find themselves in. South Africa are now the top-ranked ODI team in the world, and have beaten Australia twice in their last two T20 Internationals, but their reputation as ‘chokers’ hasn’t yet been entirely shaken off. 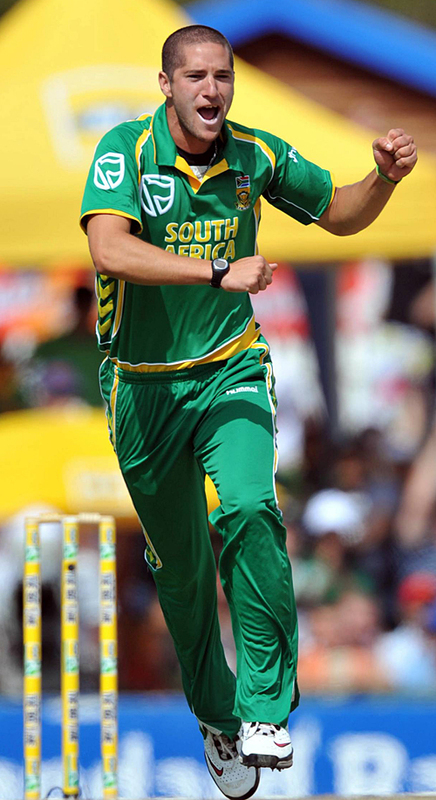 The recent emergence of the likes of JP Duminy and Morecambe’s own Wayne Parnell – along with the experience of players such as Kallis, Steyn and Smith – may prove enough for the Saffers to finally get their hands on an ICC trophy. Bangalore’s main pre-season activity was the purchase of Kevin Pietersen and KP will join a host of his fellow countrymen in Kallis, Steyn and Boucher. Last year the Royal Challengers finished seventh of eight teams, with only 4 wins, and Rahul Dravid didn’t look much of a Twenty20 batsman last time out, so it is to be hoped that the signing of Pietersen and the availability of Nathan Bracken following injury last year will improve things. Zaheer Khan has departed to the Mumbai Indians in a swap deal for Robin Uthappa, but Steyn and Bracken – when available – should be enough to keep the bowling up to standard. Nevertheless, the Royal Challengers are unlikely to be amongst the favourites for the competition this year (although as Rajasthan showed last year, the odds may not be a fair indicator of each team’s relative chances). Initial indications are that Chennai look strong again this year. Matthew Hayden’s retirement from international cricket means he is available for the whole competition, and new signing Andrew Flintoff, if fit, could potentially be the archetypal IPL all-rounder. In addition, MS Dhoni remains a potent threat. Last season, the Super Kings lost out to Rajasthan in the final on the last ball, and the squad looks good enough to go one better this time around if fortune (and fitness) favours the Super Kings. Dehli have been hit by the loss of Shoaib Malik and Mohammad Asif, but have added Australian master blaster David Warner and English duo Paul Collingwood and Owais Shah. Perhaps most important of their new additions is ‘Dirty’ Dirk Nannes, a Twenty20 specialist who has been part of successful Middlesex and Victoria teams in the shortest form of the game. Dehli also have the likes of Sehwag, Gambhir, Vettori, de Villiers and McGrath at their disposal, so if the Daredevils can get the make-up of their side right, they have a strong chance of success. The fact that most of their overseas stars will be available throughout may lead to the odd selection problem, but they will be problems of the sort that other franchises would like to have. Last year’s wooden-spoon winners in dead last place, the Chargers suffered heavily in the batting department as Shahid Afridi, Scott Styris and even Herschelle Gibbs failed to live up to expectations. he has been recalled, and they have a preponderance of all-rounders having also added Dwayne Smith and Ryan Harris. RP Singh is also under pressure after a disappointing season last year, as is Chaminda Vaas, and Fidel Edwards’s arrival should improve the effectiveness of the bowling unit. In all, there is some hope for a better performance this year, although it would be hard for the Chargers to do any worse. South Africa and Australia, the two highest-ranked teams in the world (at least at the time of writing, India are bearing down on them with some speed), are playing some of the most compelling cricket in the world against each other. After the two three-Test series, which overall were tied 3-3, the second leg of the back-to-back ODI series is providing results which are no less interesting. The first ODI went Australia’s way (and then some), with the South Africans being trounced by 141 runs, but the momentum has swung back the other way with Saffer victory in the second match, Dale Steyn and Wayne Parnell laying waste to the Aussie batting lineup, leaving their compatriots a mere 132 to knock off for victory (something they managed in just over 26 overs). The series moves to Cape Town on Thursday – I wouldn’t like to say which way the series will go (although I’m sure some people are already working on it), but I’m prepared to predict a high level of drama and two sides going all-out for victory. The two best Test cricket teams in the world move on to the second leg of their epic clash (the first was, of course, the recent series in Australia) as the Aussies embark on their first Gilchrist-less and Warne-less (and, for that matter, Lee-less, Hayden-less…) tour of South Africa. The series will be the first for either team to make use of the referral system, and it will be interesting to see how Smith and Ponting choose to utilise it. For the tourists, much of the focus will be on the less familiar faces – the likes of old Bryce McGain and young Philip Hughes. Marcus North, recently signed by Hampshire, is also in line for a debut, probably in the First Test. For South Africa, the faces will be more familiar given the team’s performance in Australia- even to the extent that a fit-again Ashwell Prince can’t break back into the side. 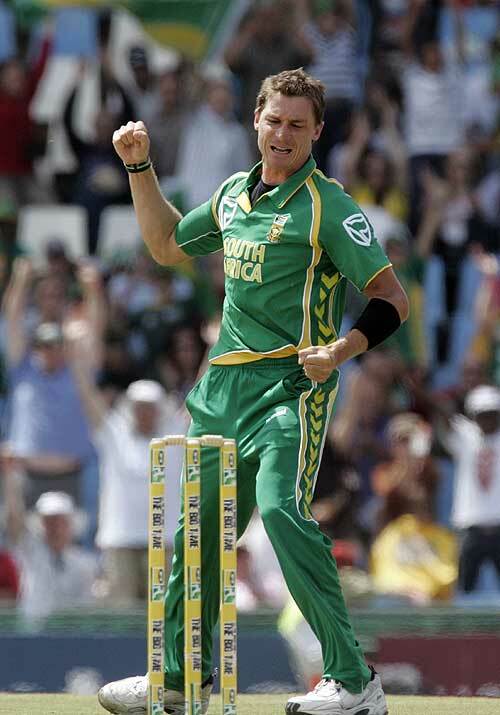 The pace attack (especially Steyn), so potent in December, will be crucial once again. After an indifferent tour of England, Dale Steyn has returned to the form he showed earlier in the year with a ten-wicket haul against Australia in the Second Test. South Africa are on the brink of what would probably be a historic series victory Down Under, and the power of their pace attack is a big factor in their recent success. Their continued effectiveness against top-level batsmen is almost enough to make me accept the absence of Andre Nel from the side.